With sustainability gaining steam as a key goal for St. Louis area municipalities, the Clean Air Partnership continues to use our blog to highlight some of the incredible eco-friendly initiatives underway in several cities across the region. These efforts are not only improving the environment, but also helping to reduce air pollution in the region. This month, we’re shining a spotlight on the City of Highland. During the 7th annual Green Business Challenge Awards ceremony, held in early December, the City of Highland received recognition for its many efforts to become more environmentally friendly, which includes the recent introduction of “No Idling” signage in front of city facilities. The idea to create “No Idling” zones was born as part of the City of Highland’s involvement in the St. Louis Green Business Challenge. The Challenge is a joint program of the St. Louis Regional Chamber and the Missouri Botanical Garden that helps businesses of all types and sizes to integrate “Triple Bottom Line” (fiscal, social and environmental) measures into the kinds of daily operations common to every business. Participants identify and adopt strategies that improve financial performance and engage employees in voluntary measures to reduce environmental impacts. The City of Highland saw “No Idling” zones as a way to reduce emissions and its carbon footprint. Since introducing the zones at city facilities, the City now has plans to extend its efforts to schools and businesses. Additional municipal accomplishments made by the City of Highland have included the enactment of a leaf-burning ordinance, the establishment of a community recycling policy for curbside recycling and department practices, the institution of a Complete Streets Policy and the installation of LED lighting throughout the community. Highland has also been recognized as a Tree City USA community for 27 consecutive years. 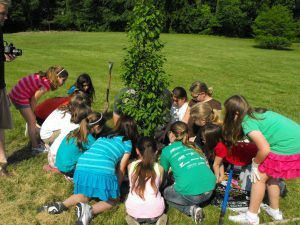 Cities achieving Tree City USA status are required to have an ordinance for maintaining and enhancing community forests. In recent months, Highland has also created an opportunity for children to interact with nature through the creation of a mini-ecosystem at the City’s Silver Lake Park. With the support of Madison County, the City of Highland continues to build on its accomplishments to further its work in sustainability and ultimately improve the quality of the air we breathe. To learn more about the link between sustainability and air quality, explore our website, like us on Facebook or follow us on Twitter at @gatewaycleanair. For more information on the sustainable efforts underway in Highland, check out the St. Louis Green Business Challenge website at http://stlouisgreenchallenge.com/.